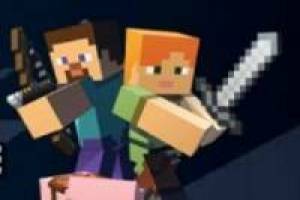 The adventures of Minecraft World return with the second part of their game, that if you have not tried the first one, you should not take long to do it. It is a game set in the Minecraft world but, that has nothing to do with the original game. Here, a great classic like Super Mario Bros has been covered and levels have been created with the elements and enemies typical of Steve and the whole pixelated world of Minecraft. You must use the arrow keys to move and the space bar to jump. Hit the chests, which act like Mario Bros blocks, and get gems to add to your score. Perform the jumps correctly to avoid falling into the void and dodge your enemies, or kill them, to complete each level of Minecraft World 2. If you' ve played Super Mario, I' m sure you' ll soon get the way to play this peculiar game of Minecraft since, practically, it' s the same. Jump on your enemies to eliminate them and clear the path towards the end of the phase. Do not miss the best platform game Super Mario Bros style that brings us this Minecraft World 2. Enjoy the game Minecraft World 2, it's free, it's one of our minecraft games we've selected.